Today I have been working on a squint roof .. I have Infilled the areas where the trusses meet with rafters ..
What angle is the plumb cut ? I know how I did it but my friend has a app on his phone which , in my eyes , got the seat and the plumb cut the wrong way round . Today I have been working on a squint roof ..
Can you define "squint roof"? It's relevant if I don't know what a squint roof is. If I'm understanding dog-leg correctly, you were filling in the valley between the two sections and the plumb cut on the valley jacks will be 40°. Can't really see how there can be a debate about it, a 40° pitch is a 40° pitch and the plumb cut will be 40° on all the rafters. When I’m cutting a roof the angles are not something I tend to ponder over too much as all my angles are on a scrap piece of timber after being worked out with a string line,spirit level and sliding bevel. The 50 degree is what’s left to make a right angle and this is what I think you mean by the plumb cut being 50 degrees?? Btw I agree with ayjay. Plumb cut is always same as the pitch. Thanks for our reply stevie . I did wonder if it was something to do with that because when using a mitre saw on 0 degrees it is actually cutting at 90 degrees ? Could this be where the confusion is coming from ? I use a square and pivot so the angle lines up with the same angle as the roof then my seat cut is just square off of the 40 degree plumb line . 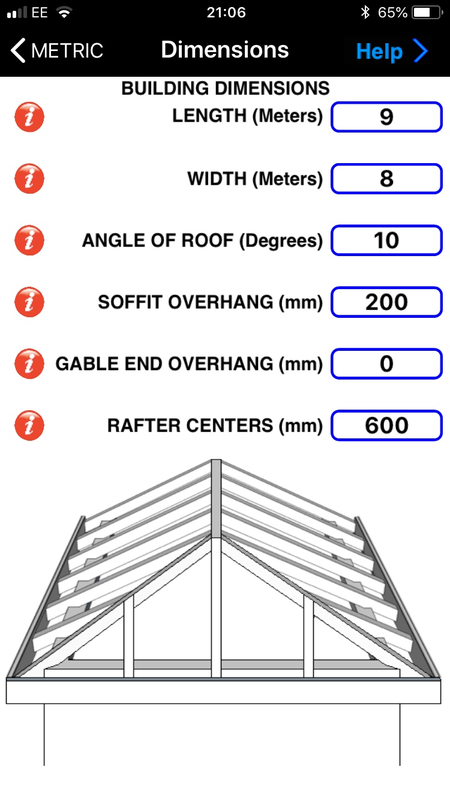 Thanks for your interest in our roof app and if I'm getting your query correct, if the angle of the roof is 40 deg. 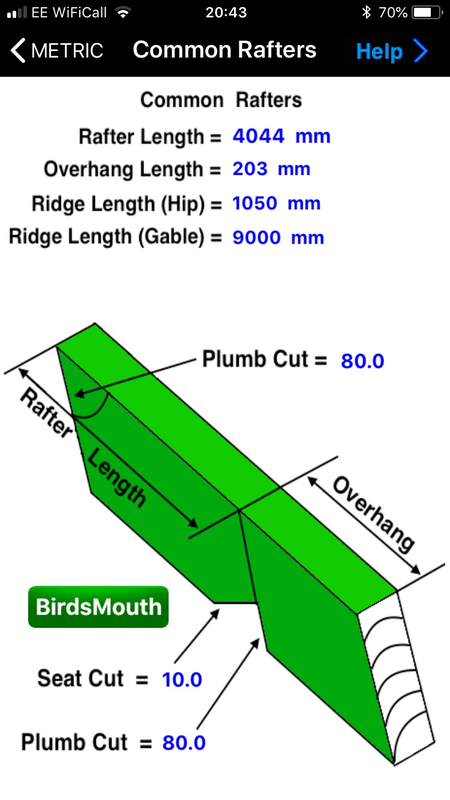 Then the plumb cut which is the vertical cut is def. 50 deg. and the seat cut which is the horizontal cut which sits on the top of plate is 40 deg. 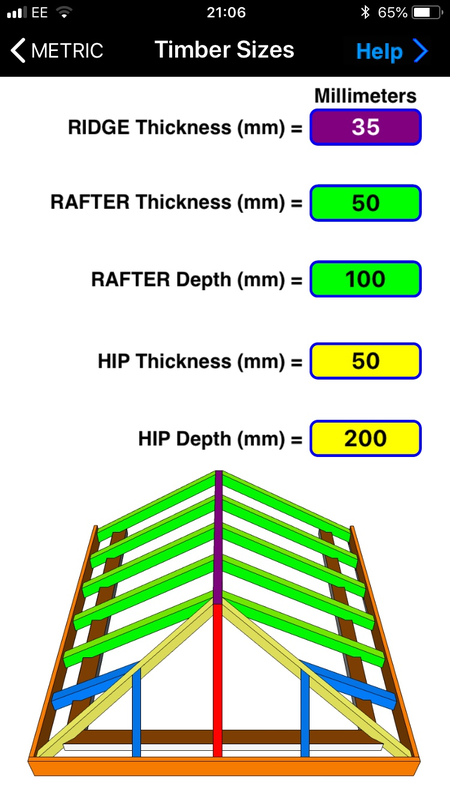 I'm sure you must be just visualising it wrong, a roof angle of 40 means the rafter is angled at 40 deg from the horizontal plane, I hope my explanation solves your query but trust me the app is correct, happy roofing. I did a 10 degree mono pitched roof last month and the plumb cut at the ledger certainly wasn’t 80 degrees!! Thank you , I’m not going insane ! See if you set a string line from the ridge to a stick nailed on the vertical(put a nail at top of overhang point and wrap line round this) you can get all the angles you need by laying a sliding bevel against the ridge,wall plate etc and mark them on a scrap piece of timber. Works for setting the hip as well which is a whole different ball game for angles. Love seeing and listening to the different ways to get the same outcome - however I have never seen anybody do that on site .. the app also gives the hip angles , do you recall any roofs and remember the hip angles so I can put it in the app to test ?